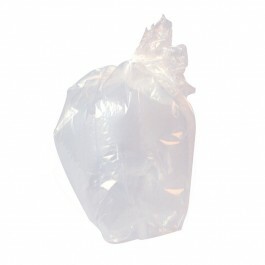 Clear refuse sacks are becoming more and more popular as the waste contents can be easily seen. This helps ensure only the correct type of waste items are placed in to the refuse sack. A very popular bag in food environments, but also equally effective in airports, rail stations and public areas, helping prevent potentially dangerous items being placed unnoticed into waste containers. Guaranteed to reduce levels of waste and a useful product to ensure pilferage is not taking place. The System Hygiene Clear Wheelie Bin Refuse Sacks are high performance blended bags that are designed to fit wheelie bins up to 240ltr in size. CHSA accredited to hold 20kg of waste these bags are classed as extra heavy duty. The bags are manufactured from high performance recycled polyethylene and are very durable. Ideal for more heavy duty applications, either industrial, commercial or at home. 20kg extra heavy duty rating - approved by CHSA Plastic Refuse Sack Standard. Packed in cases of 100.